Can Electric Vehicles Go On Road Trips? Gas stations? We don't need no stinkin' gas stations! I frequently attend electric vehicle (EV) outreach events such as National Drive Electric Week, car shows, and sometimes I even get accosted at public EV chargers. In addition to questions like "how far can you go on a charge?" and "how long does it take to charge? 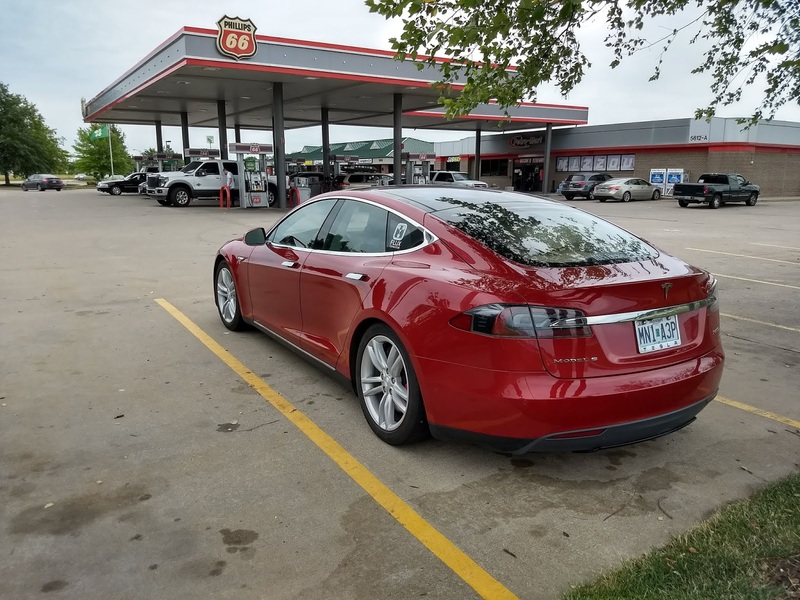 ", one of the most frequent questions I hear from drivers unfamiliar with EVs is "what happens when you want to go on a road trip?" Although people prefer a simple answer, in this case, it's complicated and it's heavily dependent on what type of car you have. The quick answer: Yes, but it may not be convenient...yet. For those unfamiliar with the term plug-in hybrid electric vehicle (PHEV), sometimes called an extended range electric vehicle, these cars have an electric drive train with an internal combustion engine (ICE) as a range extender to produce power once the batteries are depleted. In contrast to standard hybrid vehicles, a PHEV battery is large enough to allow 20-50 miles of pure electric travel, and it can be charged to minimize burning liquid fuel on short trips. One of the main selling points of PHEVs is that they can drive purely electric for short commuter trips and allow long-distance travel by virtue of its range extender ICE. Once the battery is depleted, the car functionally turns into a standard hybrid and the trip can continue by stopping at a gas station and filling up. At first glance, the PHEV drivetrain is the ideal power combination for those who mostly drive local miles, but want the options of a long-range vehicle without paying a premium price for a long-distance vehicle like a Tesla. The compromise comes in the form of complexity. PHEVs have both an electric drive train and a combustion engine, which means both systems need to be stuffed into a standard size car. 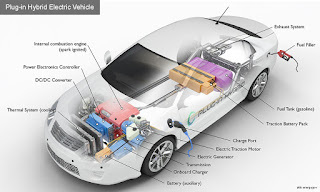 Furthermore, while pure battery electric vehicles (BEVs) can boast the advantage of reduced maintenance due to a simpler drivetrain, PHEVs will require oil changes, tune-ups, belts and hoses, antifreeze flushes, and all the other maintenance items as an ICE vehicle. Despite their imperfections from the viewpoint of EV purists, vehicles like the Chevy Volt, Ford C-Max Energi and Prius Prime are well-regarded and typically loved by their owners. Certainly their ability to handle long-distance travel similar to a standard ICE vehicle is without dispute. Teslas are quick. Teslas are cool. Teslas are the halo car of the recent EV movement. CEO Elon Musk envisioned not only a car that can go 200+ miles on a single charge, but a network of quick chargers that allows any Tesla to take long distance road trips without hours of battery charging at every stop. That network is a reality in the form of Superchargers (map). 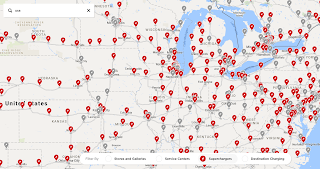 The Supercharger network continues to grow to provide a larger and more robust coverage area. Superchargers allow Tesla owners to enter a destination on their car's navigation system, and the car will plot the optimum route including Supercharger stops. The car's navigation will also calculate the minimum required charge time before the trip can continue to the next Supercharger or the destination including a healthy buffer to allow for inefficiencies and minor side trips. 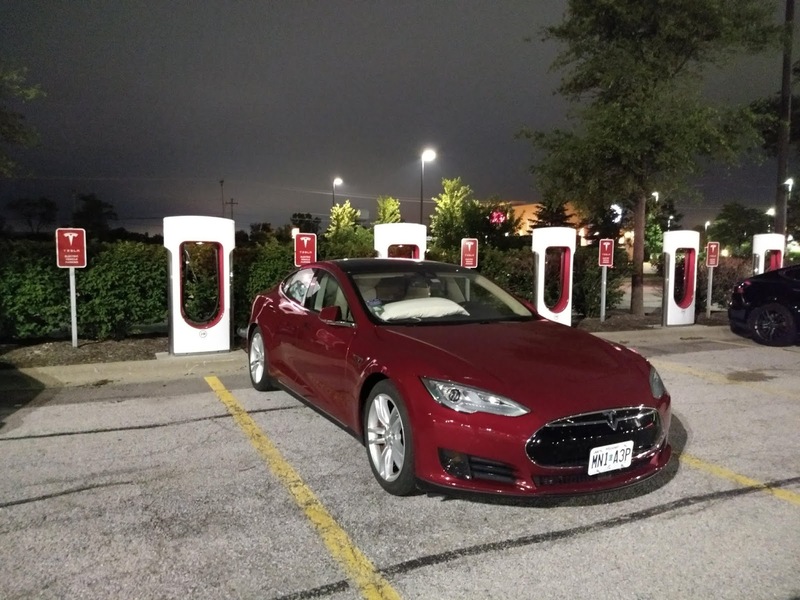 Supercharging locations typically provide 6-8 charging stalls (more in popular locations) for multiple simultaneous charging sessions. They are placed in areas adjacent to restaurants, shopping centers, and similar locations ideal for a bio-break, a coffee, or even a meal. Before you know it, the 20-30 minutes charging time required to reach the next Supercharger has elapsed and your Telsa app has notified you that you have sufficient charge to continue your journey. Although you can charge your Tesla's battery to 100%, the last 20% take a bit longer as a measure to protect the battery. Because charging speed is fastest at the lower state of charge (SOC), the most time efficient way to travel with this network is to only charge to the level required to reach the next Supercharger. Clearly you can stay longer to charge to a higher SOC if you want to take the time to, say, eat a sit-down meal. This will allow a shorter charge at subsequent Superchargers or completely eliminate the need for some stops. 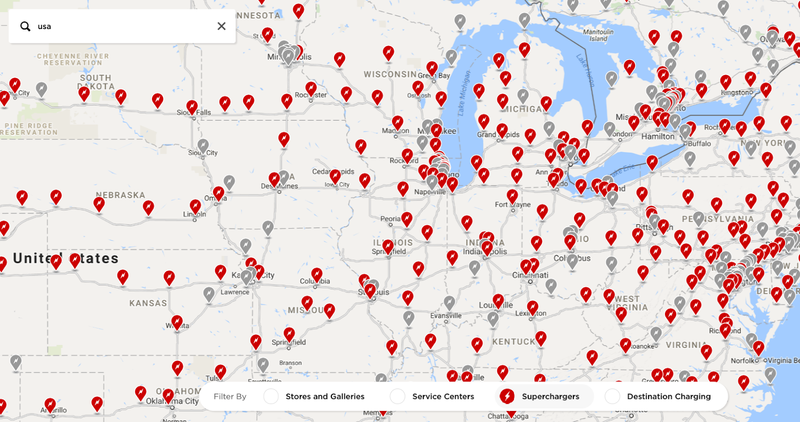 Teslas can also make use of the public EV charging infrastructure, so in addition to the Telsa-specific charging options, the growing number of public stations (more discussion below) are also available to Teslas. Each Telsa comes equipped with an adapter for the industry-standard J1772 plug that is found on nearly every public charger. While they don't provide the same level of fast charging as 120 KW Superchargers, hotels with 6.6 KW public chargers will charge a Tesla overnight. An adapter to allows Teslas to use public 50 KW CHAdeMO DC quick chargers is also available for purchase. Here's where it gets complicated. Taking your 84-mile range Nissan LEAF beyond the comfortable confines of your commuting distance can start to feel like driving a Tesla from Louisiana to Panama. How far can I go before I run out of power? Where can I charge up? What membership cards do I need? What if public stations don't work or they're only open during business hours? A bigger battery with more range is better. DC quick chargers along your route are essential to avoid long charge times. Make sure to have membership cards for accessing all charging networks along your route. Unlike ubiquitous gas stations for ICE vehicles, EV charging stations are not yet everywhere. They're also on separate networks that require memberships and not just a credit card. 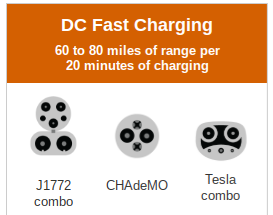 Furthermore, the DC quick chargers required for long distance travel are even less prevalent. While even a standard 120V outlet can be a car charger, it's a matter of charging speed. A discussion of charging levels is therefore appropriate. If this is too much detail, just skip the "charging levels" discussion and focus on the time required to charge. EV charging levels are all about power and time to charge. 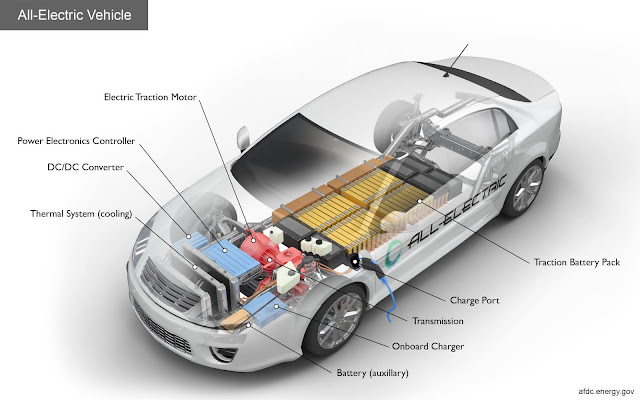 EV battery capacity is rated in kilowatt-hours (kWh) and charging power is rated in kilowatts (KW). If your EV battery holds 30 kWh and you charge at a rate of 50 KW, theoretically the charge time will be 3/5 of one hour or 36 minutes. That much power requires some serious charging infrastructure, so unfortunately, not all chargers are that fast. To identify which chargers are how fast, the Society of Automotive Engineers (SAE) has developed the Level designation. Alternating Current (AC) Level 1 - 2 to 5 miles of range per hour of charge. A 12-hour overnight charge would add 24-60 miles of range. AC Level 2 - 10 to 20 miles of range per hour of charge. Most public stations are now at 6.6 KW which tends towards the higher range. A 12-hour overnight charge would add 240 miles of range. Level 1 charging is largely inadequate for road trips. An overnight AC Level 2 charge would be enough to nearly fill the battery of a Tesla Model S with an 85 kWh battery. Maybe a 1-hour lunch stop could add another 20 miles for a total of 260 miles. If you start with a 24 kWh Nissan LEAF, the overnight charge brings your maximum range to 84 files. Add 20 miles at lunch and you're just over 100 miles. This somewhat limits the practical range for a road trip on a short-range EV. Enter Direct Current (DC) Quick Chargers. AC charging uses your car's on-board AC to DC converter (aka, the charger) since batteries deliver power in direct current. This is similar to the little charging cube that comes with your cell phone which takes household 120V AC power and converts it to USB 5V DC power that your phone's battery can use. DC power bypasses the on-board charger and puts power into your battery directly and is thus not limited by your car's charger capacity. Most onboard EV chargers currently have a power limit around 6.6 KW. Tesla's onboard chargers are 9.6 KW with an option for dual 9.6 KW chargers. With 19.2 KW, a respectable 60 miles of range can be added per hour. The current crop of DC quick chargers runs at about 50 KW and Tesla's Superchargers are limited to about 120 KW. Assuming about 3 miles of range per kWh, that means a 50 KW charger will at 50 kWh in one hour and thus 150 miles of range. While still clearly not as fast as filling gas in an ICE car, it's much more manageable than AC Level 1 or even Level 2 charging. Ideally, highways and byways would be littered with DC quick chargers just like they are with gas stations. In the US, organizations like Electrify America and charging providers like EVGo and ChargePoint are planning to do just that, but it takes time and investment. Electrify America was born out of the VW TDi settlement, so look for that effort to make a major impact by end of 2019. Look for location additions here. 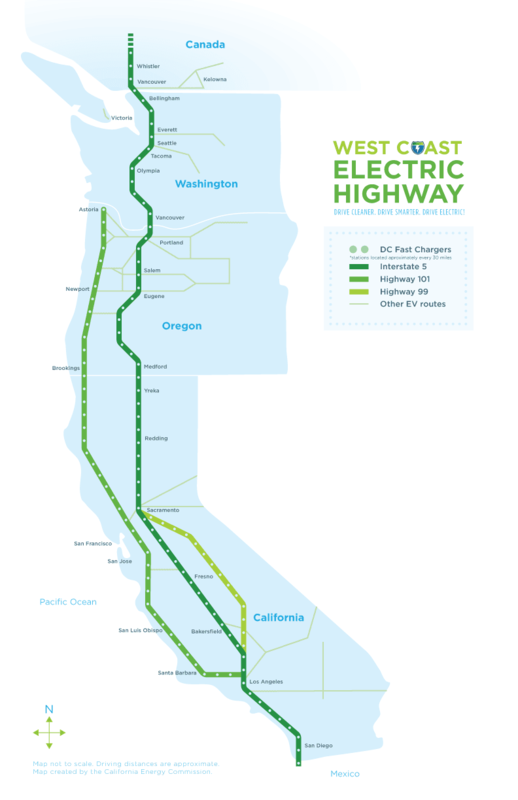 At present, certain EV dense areas of the US like the West Coast Electric Highway allow convenient EV travel along this route thanks to strategically spaced DC quick chargers. 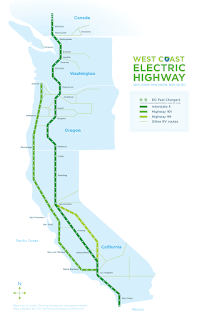 There are even some fun road trip travel logs for this route like Road-Tripping On The West Coast Electric Highway. 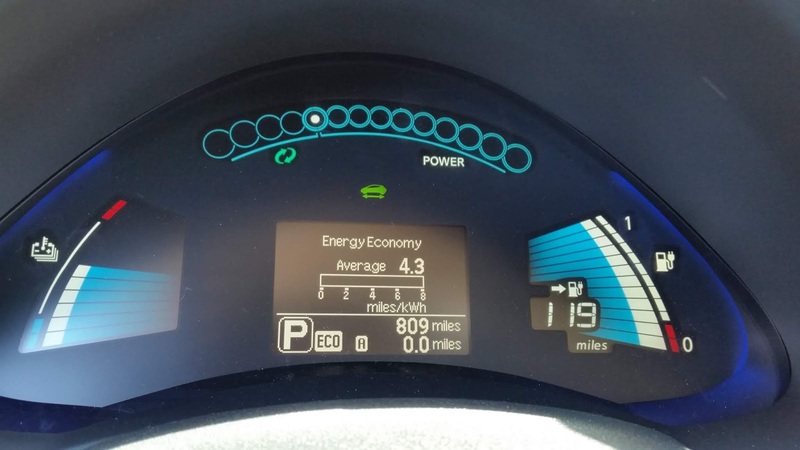 Blogger Dave Laur on the Pacific Coast shares his experiences of driving several generations of Nissan LEAFs (currently on the new 2018 40 kWh model). On the other side of the Atlantic, YouTuber Ian Simpson has been video logging his adventures with an early Nissan LEAF and more recently a Nissan eNV-200 electric van and a Renault Zoe EV. Many of these road trips include quick charging on Britain's motorways. How Do You Find Chargers and Especially DC Quick Chargers? While each charging network has their own map of chargers like this one for ChargePoint, they are not comprehensive. 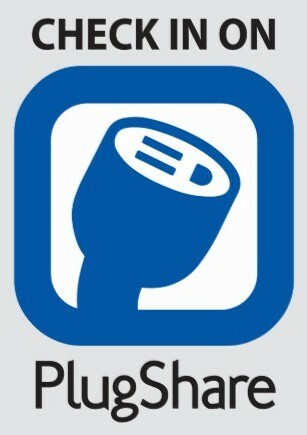 The best website and app for NorthAmerica is PlugShare. PlugShare is crowd-sourced, so while it's not perfect and not always 100% up to date, it is the single best resource for researching the public charging infrastructure. 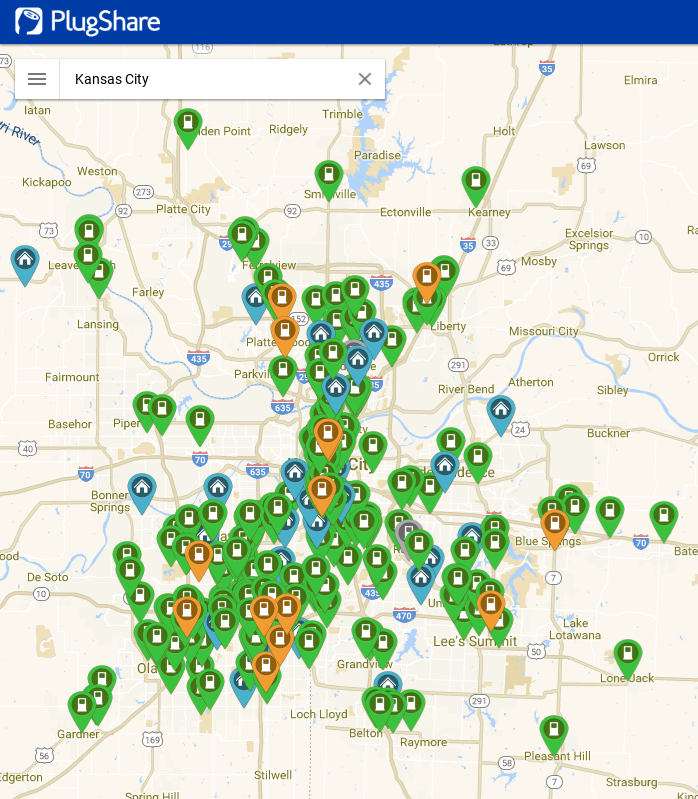 As the name suggest, PlugShare started as a way for EV drivers with home chargers to share their plug-in locations in areas where the public infrastructure was sparse. While that feature is still available as represented by the blue house icons (see image on right), PlugShare has primarily become more useful with the addition of public Level 2 stations (green station icon) and DC quick chargers (orange station icon). EV drivers using the stations can also "check in" and give feedback about what network a station is on, whether the station was in working order and not blocked by non-EVs (aka "ICEd"), post pictures of the location, and if there are amenities nearby while you wait for your car to charge. Successful check-ins translate into a numerical rating from 1 to 10 with a 10 indicating that the station has been completely reliable and available. Before relying on a station to be operational, it's always good to look at the rating and recent check-in comments. Sometimes a top-rated station can suddenly stop working and won't be of any use until it's repaired. In any event, download the free PlugShare for iOS or PlugShare for Android at your earliest convenience. If you already use public chargers and PlugShare, please contribute and check in, leave feedback, and add pictures. read the book Off The Grid and are bound and determined to make your next road trip electric no matter what. For those in the Option 3 camp, you're my type of die hard enthusiast! In the next episode, I start to plan for a 700-mile EV road trip adventure into the chargerless wild from Kansas City, Missouri to Muskegon, Michigan in my 2016 Nissan LEAF with a 30 kWh battery. YouTuber Ian Simpson in the UK. Road Trips For Short-Range Electric Vehicles Iceland's 900-mile Ring Road connects most of the inhabitants and tourists along the perimeter of the geologically active island. While electric vehicles (EVs) are not yet available for visiting tourists, the frequency of EV sightings was astounding. 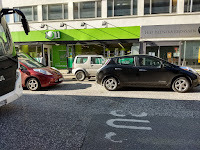 The gentle whirr of the Nissan LEAFs Vehicle Sounds for Pedestrians (VSP) was as common as the unmistakable diesel compression combustion sound from passing buses. Iceland has very few resources, but in addition to an abundance of sheep, the island nation boasts nearly unlimited geothermal heat that is also the primary source of the island's carbon-free power source. The government even sweetened the deal for EV drivers by blanketing the Ring Road with free DC quick chargers with spacing so that even short-range EVs can circumnavigate the island. Compare that to nearly $8 per gallon of diesel and suddenly the rise of EV popularity makes perfect sense. EV Home Charging - An Introduction Whether you are thinking of getting a plug-in vehicle or you have already made the leap into electrified transportation, one of the logical first questions is “how do I charge my car?” Assuming you live in a place where you can park in reach of electrical infrastructure, this essay will be relevant for you. Even if you have already decided that a regular 120V outlet is good enough for your purposes, please read on and consider what an upgrade might provide you and at what cost. EV Road Trip Plan - Day 2 Litchfield, IL into Michigan Assuming Day 1 has gone as according to the plan laid out in the prior blog entry, I should be in Litchfield, IL on the morning of Day 2 with a full charge courtesy of Victory Lane Ford and/or Level 1 (120 V) charging from whatever hotel I select. Day 2 will trace along Interstate 55 and Historic Route 66 into the Chicago outskirts. Thanks to several EVGo DC Quick Chargers (DCQC), I anticipate zipping along the southern edge of Lake Michigan rather quickly. And I'm Off On a normal road trip, I tend to check out of the hotel, refill my coffee cup and hop on the highway. In this case, range and speed efficiency is everything. Therefore, I'll stick to back roads where I can travel 45-50 MPH. I recently retired from the chemicals industry and am in the process of cultivating new passions, especially related to electric vehicles (EVs) and sustainable living. If you need a consultant regarding EVs, EV charging, or a speaker on the subject, please message me.